Most golfers have a course in mind when they think of their favorite place to hit the links. But what about certain cities? With plenty of warm sunny days, affordable housing and a wide range of golf courses, some cities are better suited for regular trips to the course. 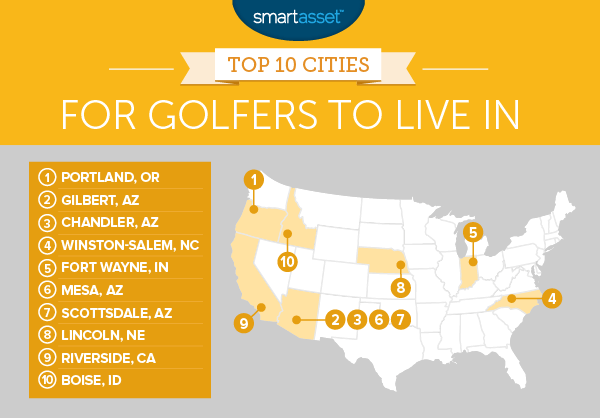 SmartAsset looked at these and other factors to find the best cities for golfers to live in. Compare the best rewards credit cards here. 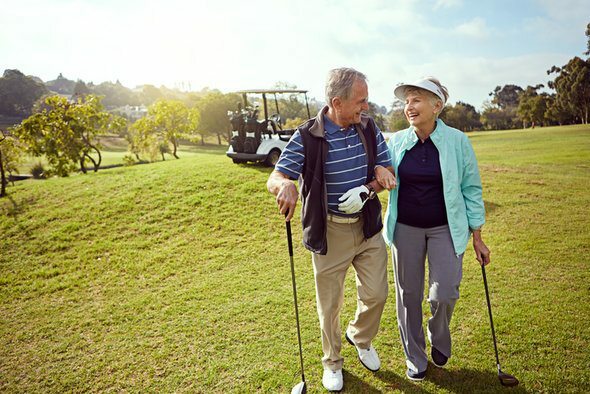 In order to find the best cities for golfers to live in, we looked at data on factors relating to both golfing and livability. We looked at the density of golf courses and clubhouses, the number of rainy days and days with extreme temperatures, as well as unemployment rates, housing costs and income after housing costs. The idea was to find a city that someone could reasonably expect to have a job and decent disposable income, also with available golf courses and favorable playing weather. Read our data and methodology below to see where we got our data and how we put it together. Arizona and North Carolina dominate – These two states make up seven of our top 15 best places for golfers to live. These states combine great weather and plenty of golf options to make for ideal golfing experiences. Smaller cities mean more golfing – The smaller cities in our data set tended to have more golf courses per capita. If you are a person looking to maximize time on the green, you may have to give up living in the big city. The five largest cities in the country, measured by population, are New York, Los Angeles, Chicago, Houston and Philadelphia. All of these cities rank in the bottom 30 for best cities for golfers to live. Mixed weather – Would you prefer golfing when it’s 60 degrees and cloudy with a chance of drizzle, or 100 degrees without a cloud in the sky? Our top 10 offers a mix of cities which tend to have one or the other. Portland, Oregon, for example, gives golfers the chance for mild temperatures with the near-constant threat of rain. In Mesa, Arizona on the other hand, there is no risk of rain but heat stroke may be a possibility. Phoenix metro area on top – Four cities in the Phoenix metropolitan area cracked out top 10. In order of rank they are: Gilbert, Chandler, Mesa and Scottsdale. Portland, Oregon tops our list for the best cities for golfers to live in. Surprised? With 4.48 golf courses per 100,000 residents, Portland leads the way in access to golf courses. While access to golfing is important, Portland also has high scores in a number of other categories as well. PDX scores in the top 25 for property crime, days with extreme temperatures and income after housing. The one concern is that it rains pretty often in Portland. In fact, only one city in our list sees more rainy days than Portland, but at least that means the course will be green! Gilbert beats out the other three Arizona cities on this list to snag the second spot. The difference between the four cities is not large. They share the same access to golfing (150 golf courses) and similar weather patterns (an average of less than 16 rainy days a year). The biggest difference between them – and why Gilbert comes out on top – is income after housing and property crime rate. Gilbert’s median household income after housing is $68,729 and its property crime rate is 1,320 per 100,000. It ranks in the top 10 for both of those metrics. Chandler is home to some of the highest-earning residents in the country and has plenty of access to great golf courses. According to Census Bureau data, there are 150 golf courses and country clubs in the Chandler area. So if you’re a golfer who values variety and loves to switch it up, this city may be a good fit for you. Chandler also has the 17th-lowest property crime rate in our study, a score which beats neighbors, Mesa and Scottsdale. For golfers who want to stay on the East Coast, Winston-Salem is your best bet. Winston-Salem has 3.25 golf courses and country club per 100,000 residents, the 14th-most in our study. Of the courses in the area, Olde Homeplace Golf Club may be the best. It has a 93% recommendation rate on GolfAdvisor.com. While this city is great for golfing, it may be even better for livability. It has some of the lowest housing costs in the study. Our data shows that the median housing cost in Winston-Salem is only $788 per month, seventh-lowest of any city we looked at. It may be surprising to see Fort Wayne atop a list of the best places for golfers to live in, as it is not quite as famous as say, Arizona, for golfing. But Fort Wayne does have the third-highest density of golf courses in the country, with 3.8 per 100,000 residents. That means less time waiting to tee off and more opportunity to golf at your preferred tee time. 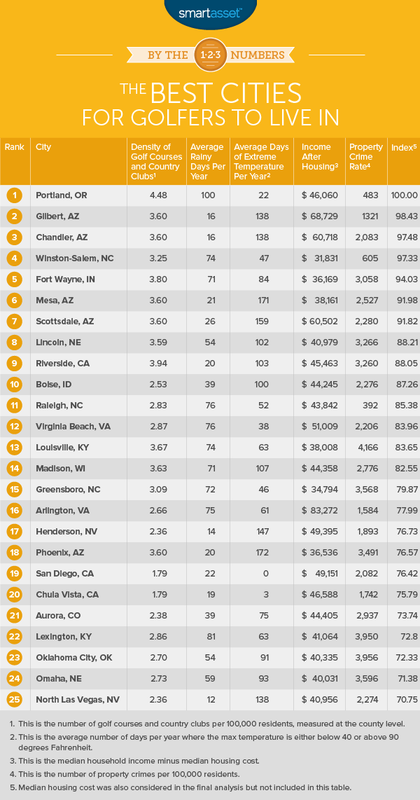 Fort Wayne is also the cheapest city to live in our top 10. The median home costs $734 per month. The city would be a great candidate for golfers looking to raise a family: In the past we have found Fort Wayne ranks very highly for best cities to raise a family. Golfing here may be more seasonal hobby however, due to cold winters (although winters in Fort Wayne are nothing compared to, say, Anchorage). Data from NOAA shows that there are almost 80 days per year where the daily high is lower than 40 degrees Fahrenheit. What do retirees like to do? Golf. Where are retirees moving? According to our research, Mesa, Arizona. Regardless if you are retiree age or not, Mesa is a great place for golfers to live. The city has the third-most golf courses per 100,000 residents in the study and it almost never rains. But if you are thinking about making golf a full-time hobby, make sure to rent a golf cart. Mesa has an average of 170 days per year where the daily high is above 90 degrees. With 150 total golf courses and country clubs in the area or 3.6 golf courses per 100,000 residents, Scottsdale offers a great amount of variety and access to golf courses to golfers who live in the area. One reason why Scottsdale ranks so high is that it’s relatively affordable. The median household in Scottsdale has just over $60,000 left over after housing. With all that leftover cash maybe one day you’ll be able to save up enough for a trip to play at Pebble Beach! Lincoln, Nebraska has a similar profile to Fort Wayne. Both cities score high on livability and access to golf courses. Census data shows while that there are only 11 golf courses in the area, after taking population into consideration, Lincoln actually ranks well in this factor. There are 3.59 golf courses and country clubs per 100,000 residents, which is only 0.01 less than the Arizona cities ranked above. Mahoney Golf Course, located right in the city, is a good option for golfers who don’t want to travel too far to get 18 holes in. The course record is 62 for men and 68 for women. With enough practice, maybe you’ll be able to top it. Golfing is great but you don’t want to break the bank doing it. That is where Lincoln shines. We have found that you can live comfortably in Lincoln without being a millionaire. The city’s median monthly cost is $877. It may be a surprise to see only Riverside representing California, given the state’s famously great weather. But while cities like San Diego, San Francisco and Los Angeles all do score well in our weather metrics, they do not score as well in our golf metrics. Riverside bridges those two concerns. Riverside ranks 10th in the study for least number of rainy days and has the second-highest concentration of golf courses. Our top 10 ends in Boise, Idaho, a city with plenty of offerings for potential golfers looking to live in the area. Boise comes with 2.53 golf courses and country clubs per 100,000 residents and low cost of living. For example, you would need to spend 50% less on housing in Boise than you would in Riverside. If you’re serious about your golf, that 50% you saved on housing can go toward a lot of extra tee time. Golf courses and country clubs per 100,000 residents. This metric is measured at the county level. Data on country clubs comes from the Census Bureau’s 2015 Business Patterns Survey. Population data comes from the Census Bureau’s 1-Year 2015 American Community Survey. Median monthly housing cost. Data comes from the Census Bureau’s 1-Year 2015 American Community Survey. Unemployment rate. Data comes from the Census Bureau’s 1-Year 2015 American Community Survey. Rainy days. This is measured as the average number of days per year with at least 0.1 inches of precipitation. Data comes from NOAA (the National Oceanic and Atmospheric Administration) and is the 30-year average from 1981-2010. Extreme temperature days. This is measured as the average number of days per year where the maximum temperatures are either below 40 degrees Fahrenheit or above 90 degrees Fahrenheit. Data comes from NOAA (the National Oceanic and Atmospheric Administration) and is the 30-year average from 1981-2010. Median household income after housing costs. This is the median household income minus median annual housing costs. Data comes from the Census Bureau’s 1-Year 2015 American Community Survey. Property crimes per 100,000 residents. Data is from the FBI’s Uniform Crime Reporting Program and from local government websites. We ranked each city in each of the six factors, giving a double weight to golf and country clubs per 100,000 residents and a half weight to our two weather metrics: average days with rain and average days with extreme temperatures. We then found the average ranking for each city. Our final score was based off this ranking. The city with the highest average ranking received a 100, while the city with the lowest average received a 0.